We first started working on the design for this home last summer. Shortly after we finished the design the homeowners took a trip through southern California and fell in love with the desert feeling and many of the plants. This took us back to the drawing board for some serious rethinking. Here is the blank canvas we had to work with. There is a slope from the house to the back fence. Additionally the last ten feet work as a drainway for many of the neighboring homes; it was a sloshy mess. They wanted lots of space for entertaining and fortunately they have plenty of space to work with. The clients already had an Eco-Burner fire feature and need a place for it. Partway into the design they found some cool images of water features and we presented an idea for recycled glass enclosed in a gabion; that may come in a future phase. We originally were doing pavers and gravel but then they found this beautiful travertine. Here is the final design. Collaborating with a client that had a strong vision pushed me to create a very unique space. I feel the outcome will be a very fun, functional and visually pleasing space. Now to hand it off to Shawn to make it real. On this job the clients hired another contractor to put in the deck. 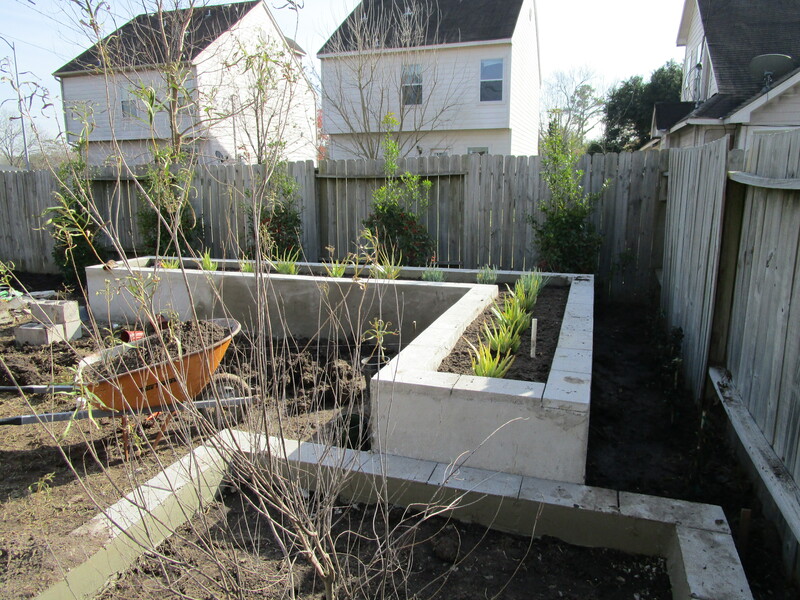 Then we came back to do the irrigation and all the raised beds. Working around each other’s schedules on top of a rainy winter and spring made this project take much longer than we are used to. We hadn’t appreciated how spoiled we were coming in and doing everything start to finish. 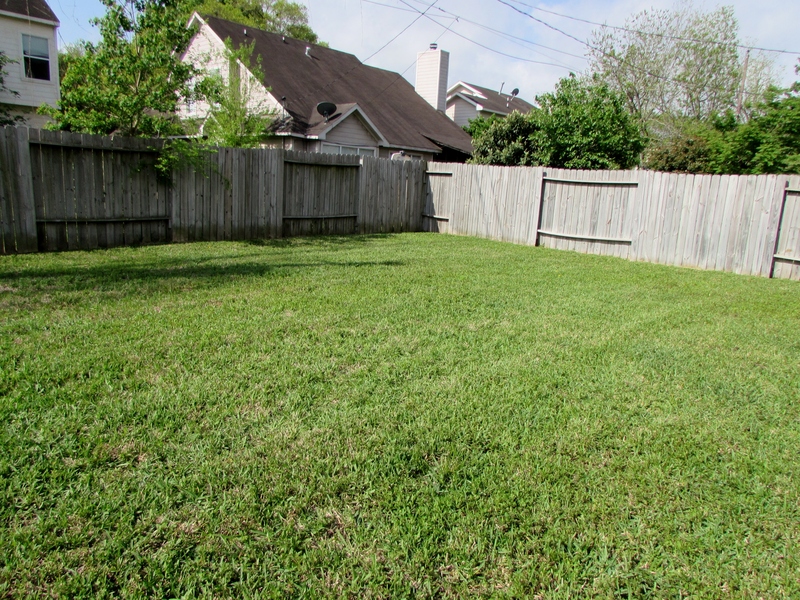 Because we knew how wet the yard would be we resisted having all of the lawn removed at the very beginning. The grass helped absorb some of the water and gave us something to stand on besides the sticky mud. 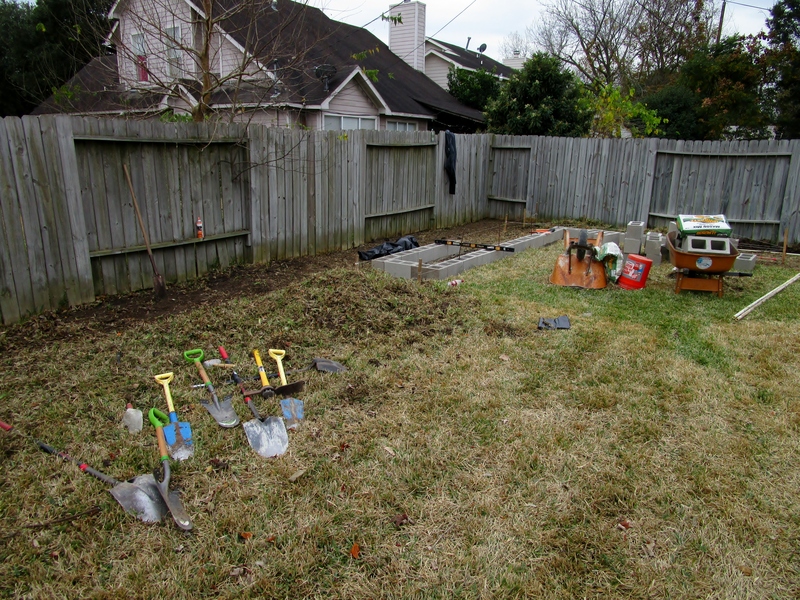 And if you live in Houston you know how sticky our clay soil gets! The first course in our raised beds are the most laborious. They set the tone for everything else and must be laid square and level. Note the Rebar sticking out of every third block. We ended up installing quite a few more; we like to make the holes through the mortar while it is still moist. All of the tiers are set; this bed finished at twenty-four inches. We wanted a more dramatic presence. Here the inside has been skim-coated with a slurry of mortar. You can see the thick mud around the rear of the bed. 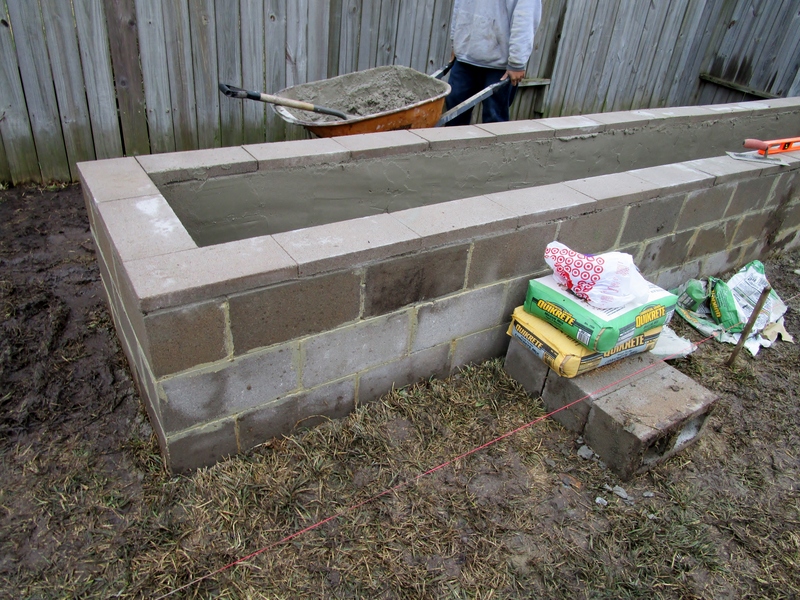 The mortar helps keep the moisture from wicking away into the cinder blocks. 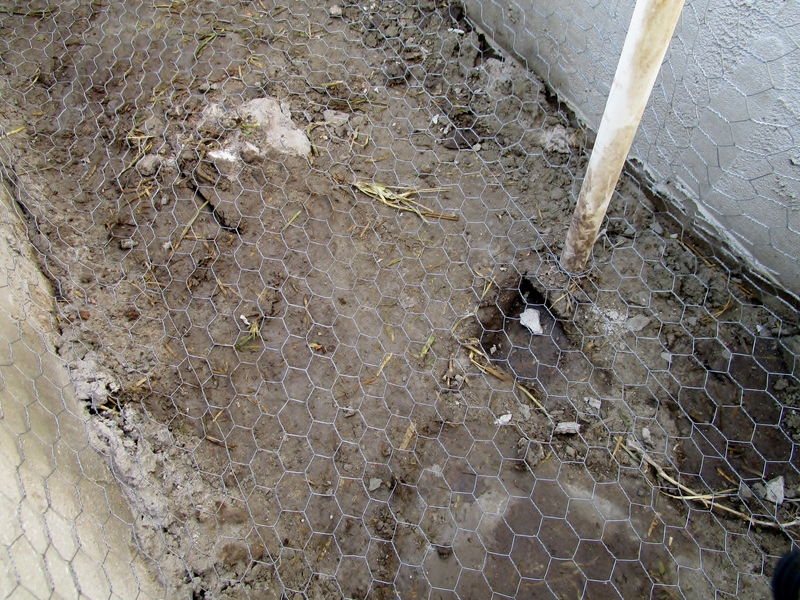 A view of the inside of a bed where we are concerned about burrowing creatures getting in (moles, gophers, etc); we install chicken wire. While it will not keep ants out anything much larger will be in for a surprise if they try to burrow through. 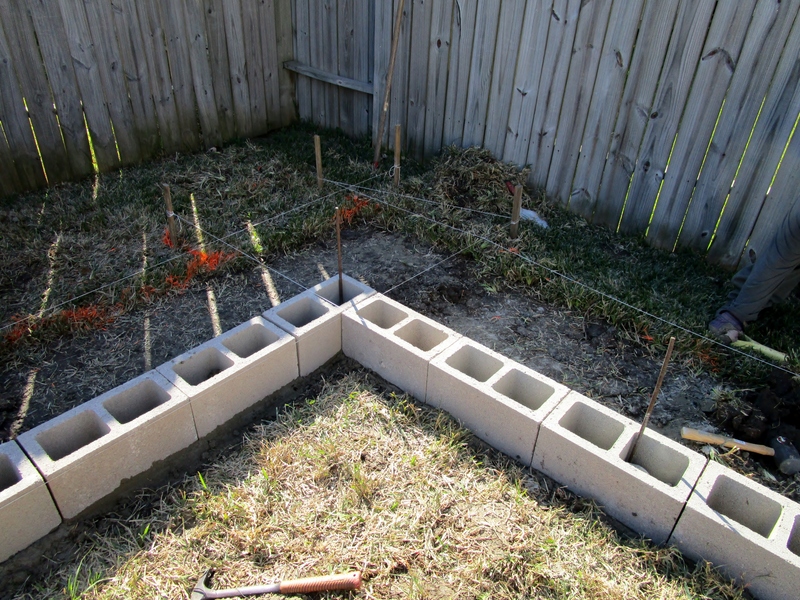 The PVC pipe is for the drip irrigation tubing which is to follow. 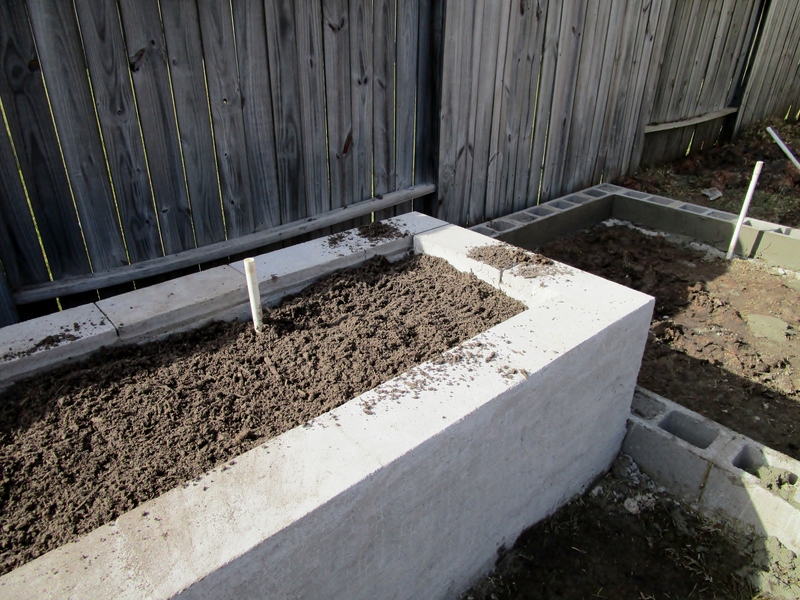 Here the tall bed has its exterior skim-coated, and the soil filled. Note that the coping stones in the rear were recently set and need to be covered. We had just finished the low bed and just sealed the interior. The two beds, while close to each other, are built independently. Returning to the theme of mud-hole we knew we needed to work to improve the drainage. The existing pipe did not provide adequate coverage so we expanded the system. The collection will start in the corner, with a secondary catchment in a future gravel section. 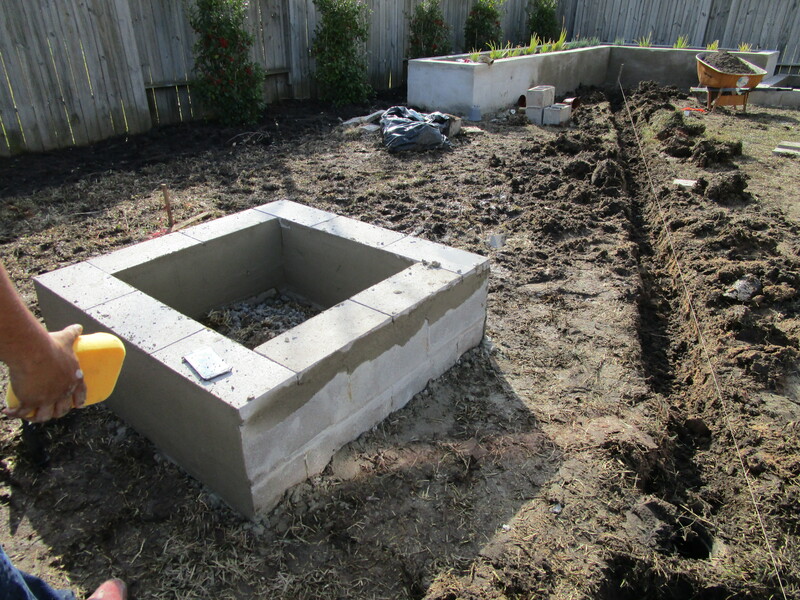 To accommodate the fire feature we built a small square fire-pit in the same style as the raised beds. We skim-coated it inside and out not only to coordinate, but also to discourage water from seeping into the blocks. A small weep-hole was left on the fence side of the construction to allow any captured water escape. The 3 tiered raised bed is planted with aloe and here in the foreground we made a 1 tier bed for the Desert willow,Chilopsis linearis . These plants are low water need but can deal with our rainfall as long as they have good drainage. Scale is important and the crew take the measurement seriously. 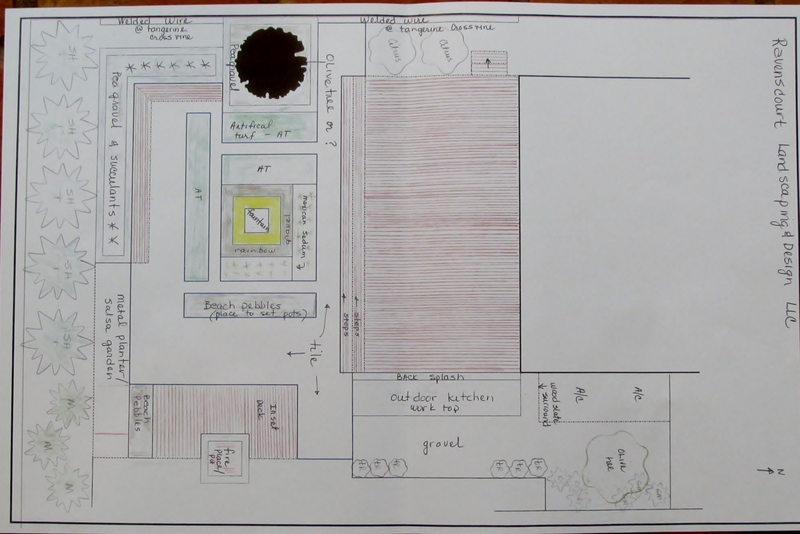 And while the drawing gives an ideal placement of the features of the garden when on the site we run across challenges that necessitate change. 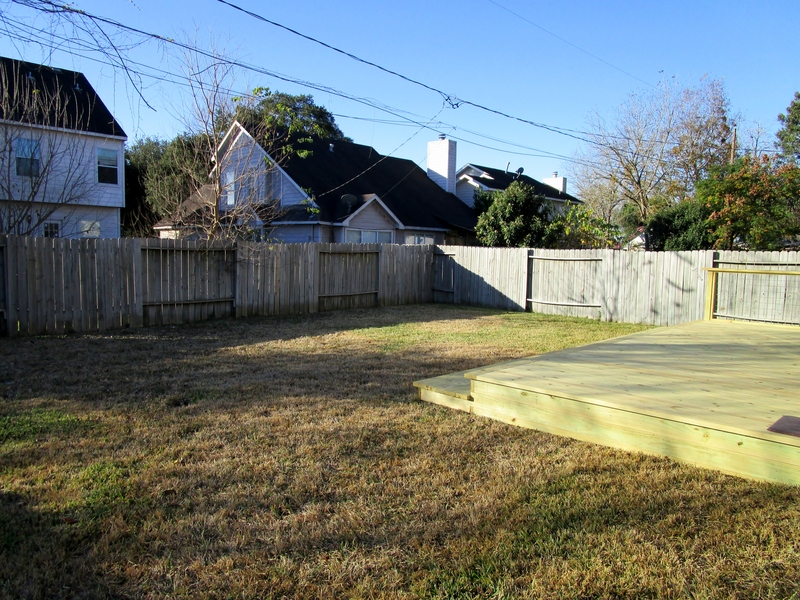 In this project the deck builders made the deck wider than the design; by about eighteen inches. While this may not sound like much things can easily begin to feel squeezed. 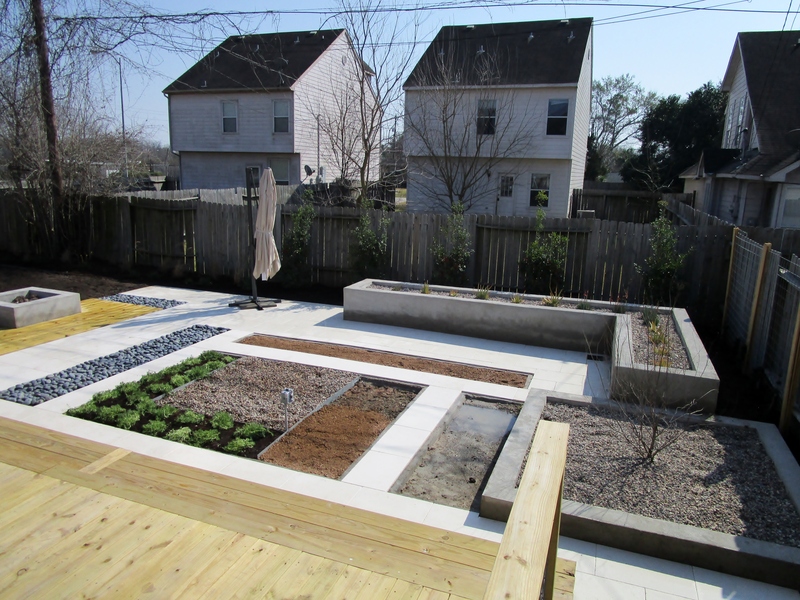 We did not want smaller raised beds and if we played with the proportions of the beds inside the patio, at ground level, the ratio would not feel right. In the end we made the bed on the south property line a little narrower. The Savannah Holly are very forgiving and eventually they will be taller than the fence as well as the raised beds. 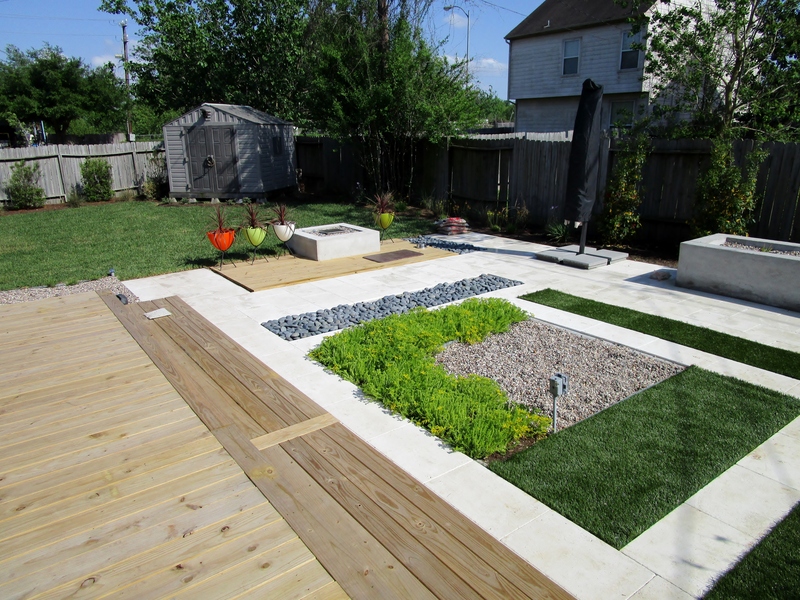 At this point we left this project and came back after the travertine paver part of the patio was installed. We came back to put in plants and gravel. We continued to fine-tune the grading of the yard; helping move the water across the property as well as towards drain boxes. Here we have the guys cleaning up. The clients use this side area to store their trashcans and we wanted to help obscure them as well as the air-conditioner condenser units. We do like cedar. 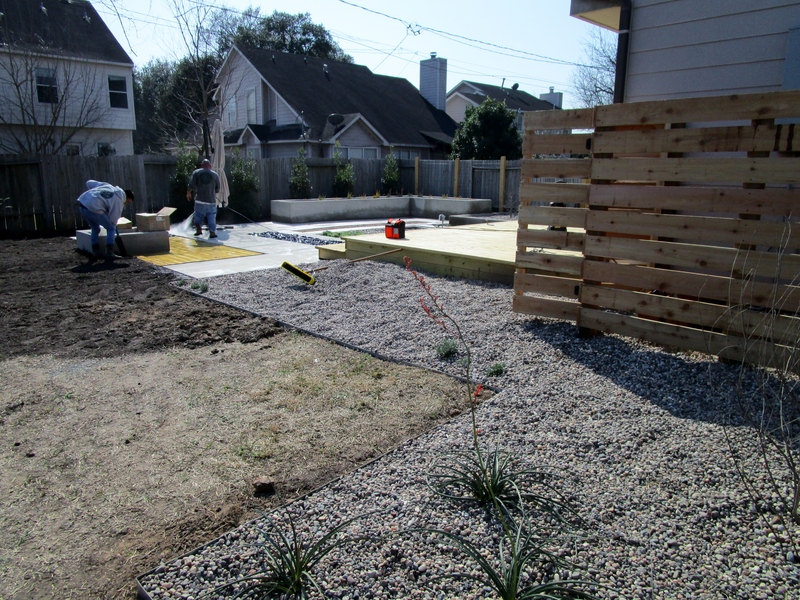 We used gravel instead of mulch in the raised beds to give more of the desert feel. These plants love heat and will be happy with gravel as mulch. 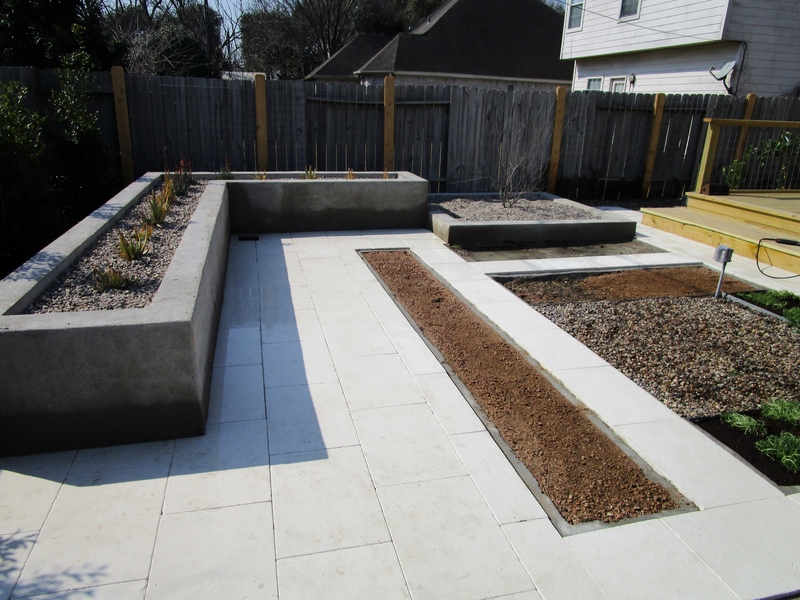 The gravel will also keep dirt from blowing out of the beds onto the patio. Behind on the west fence we installed welded wire as a trellis for vines. On the south fence we planted a row of Savannah holly that will grow nice and tall and help block the view of the houses behind as well as provide shade. Further down we planted a row of Maiden grass with a bulbine border. 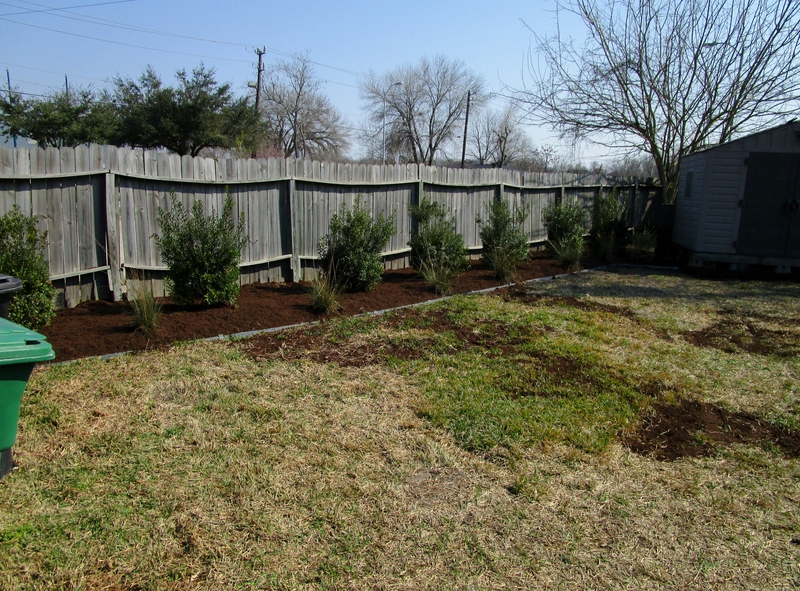 All of these plants will need very little maintenance and are frost and heat tolerant. Near the inner corner of the tall raised bed you can just make out the drain box. The rainbow gravel area in the lower right corner of this photo is where the fountain may go in the future. Electricity was run to the area in anticipation. In the mean time it is a great place to plug in a fan. The sun is pretty brutal here in the middle of the day but it should be a nice spot to enjoy in the evenings! We have most of our part of the job installed at this point. 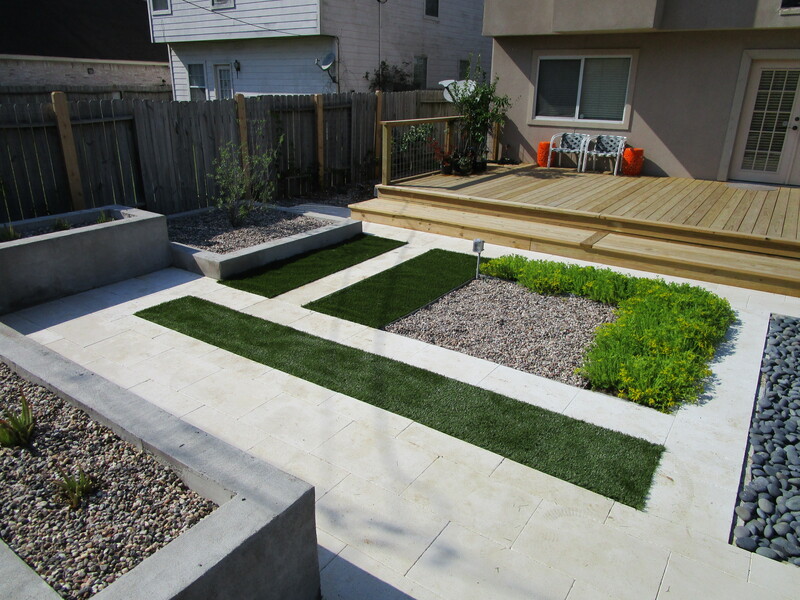 The artificial turf was on order and we had to wait for it to come in. 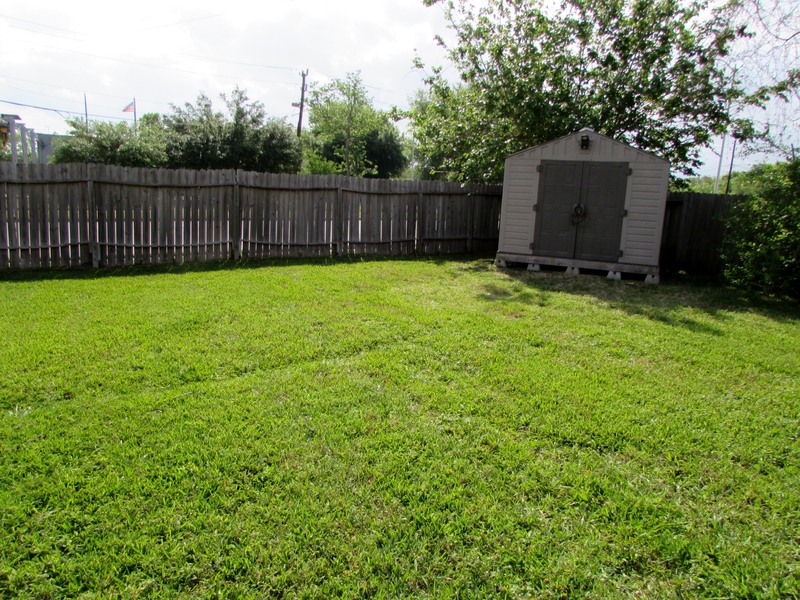 Below is the before of the rest of the yard. 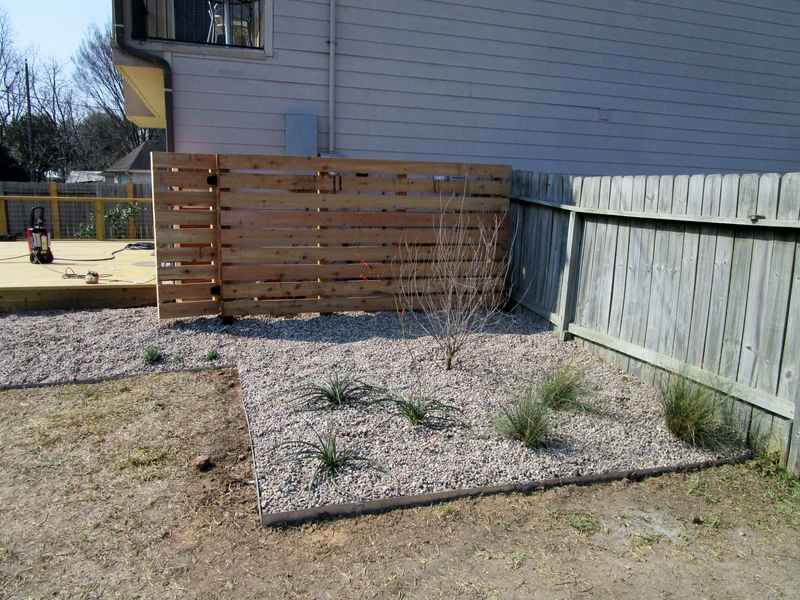 The main thing we did here was plant low maintenance plants that will provide a screen and absorb some of the street noise. 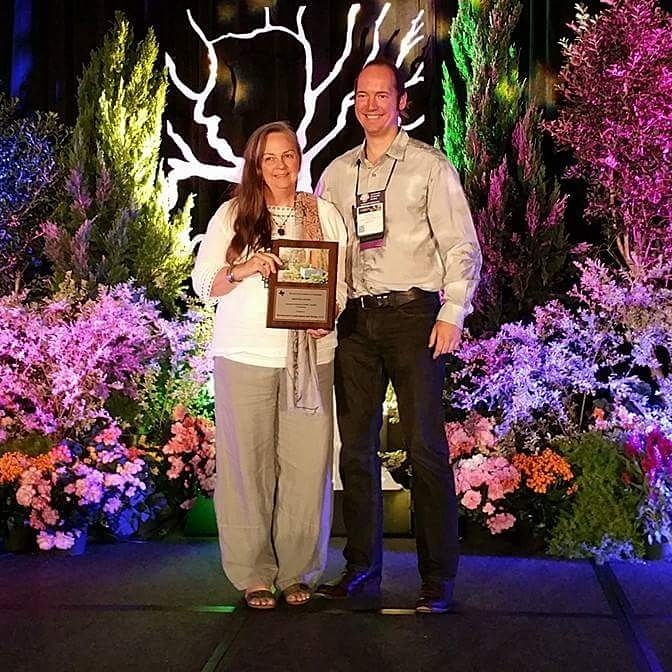 We used Wax myrtles with a smaller row of Gulf muhly to make the screen. These plants are nearly no maintenance in this space. As on almost all projects budget is a limiting factor. 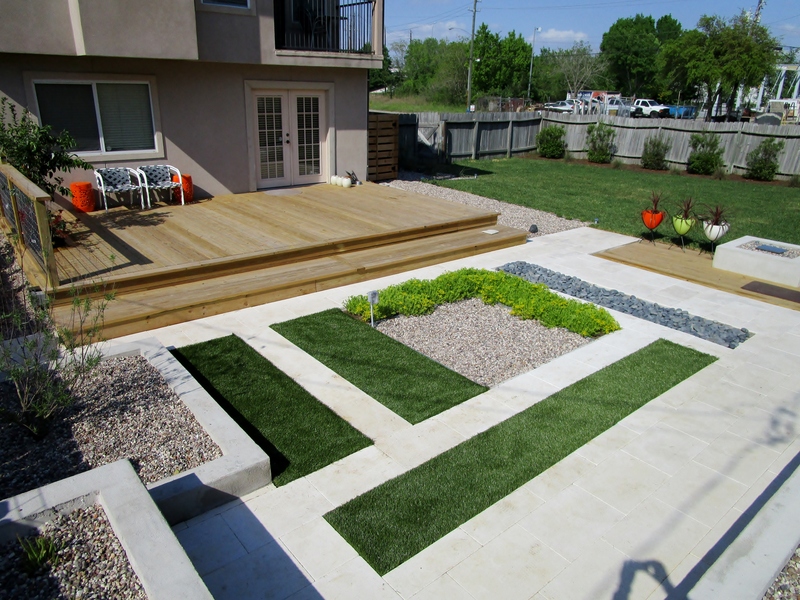 With the main patio as the focal point we wanted to get good coverage with minimal maintenance. This is an area that might get more attention later. 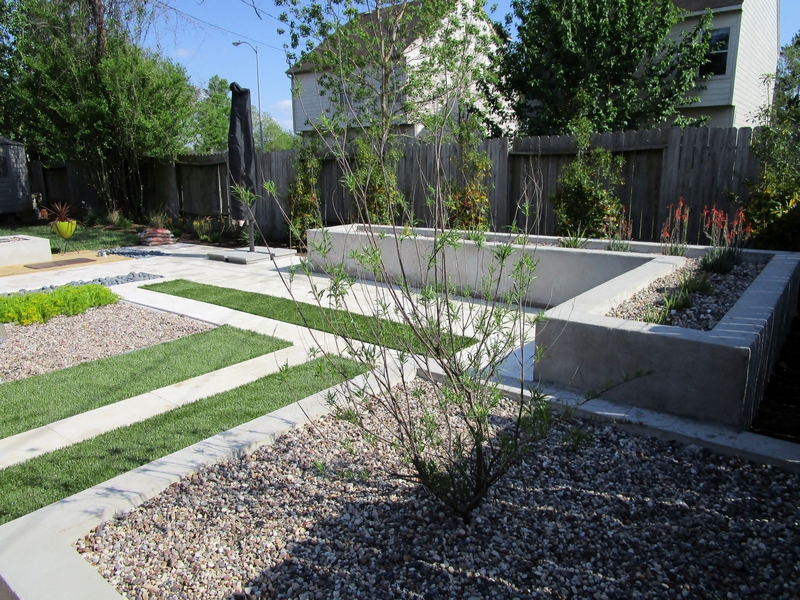 Just a few weeks back we came back to install the artificial turf strips. I am putting several pictures so you can see if from several angles. In the corner of the raised bed the Aloe ‘Blue Elf’ are blooming. Here I am standing on the bed taking a blind shot (my shadowed hands and camera down below). Across the street is a light industrial business that is not visible when standing on the ground. In a few years it will not be visible from up here either! The thin strip of Mexican beach rocks is where a second drain box is located. You can see they have started to put out furniture and planters. 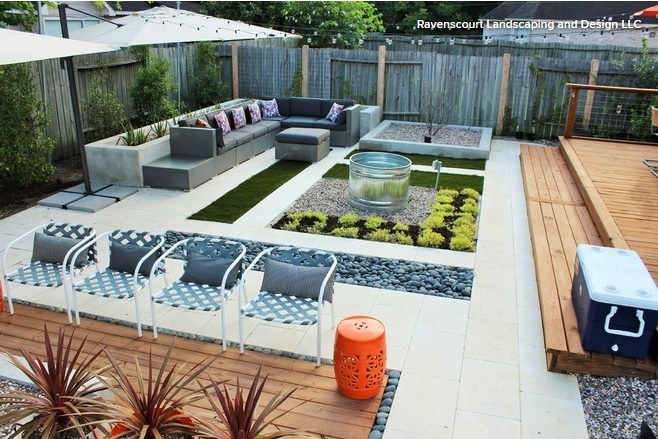 I love the pop of color and the planters are very cool! Looking back towards the house and deck you can get a better sense of how much space is now available. The Mexican sedum has already exploded in color and gave a great show this spring. This sedum doesn’t mind our clay soil or cold snaps and makes and excellent border plant. 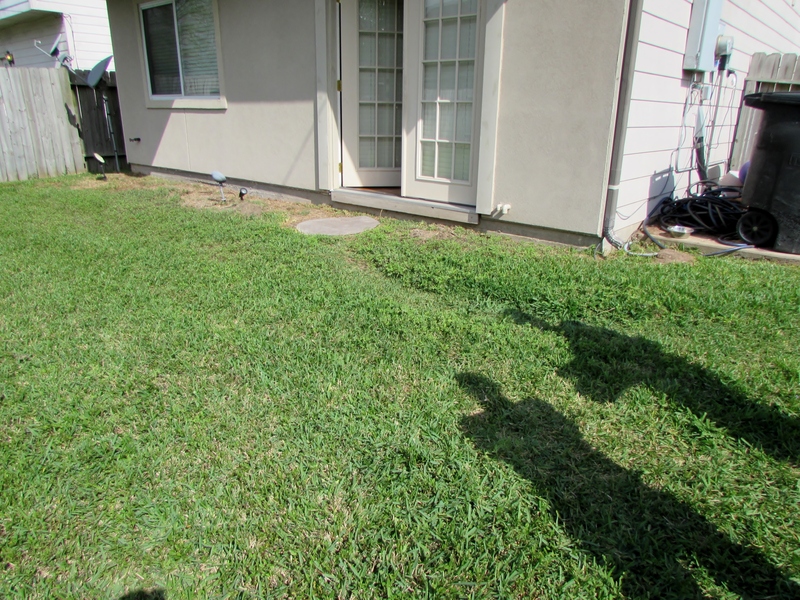 And there is still plenty of lawn which helps absorb the rains and any water that sheets off of the patio. By fall the Maiden grass between where the holly stop and the shed in the corner will be at least four feet tall with lovely plumes that will wave as they catch the breeze. In our latest conversation with the owner I learned that shade over the deck has become a high priority and will be the next phase. 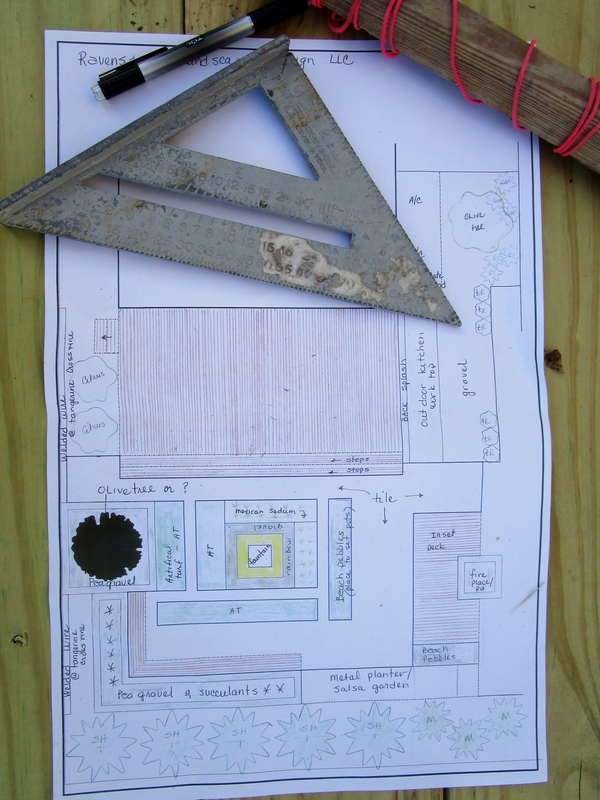 We are really hoping to come back and install the water feature and metal raised bed that are in the design. You work wonders! What a change from beginning to not quite end. Love it! Thank you Peter…it was a fun collaboration! I absolutely love it. Of course I think the rest of the lawn needs to go and this design needs to expand to fill. Loree, I totally agree. On the ordinal plans I had a live oak in the middle of the lawn. I rarely plant them but this was a big enough space. The patio and house are so exposed and the busy street and industrial buildings are a constant source of noise. 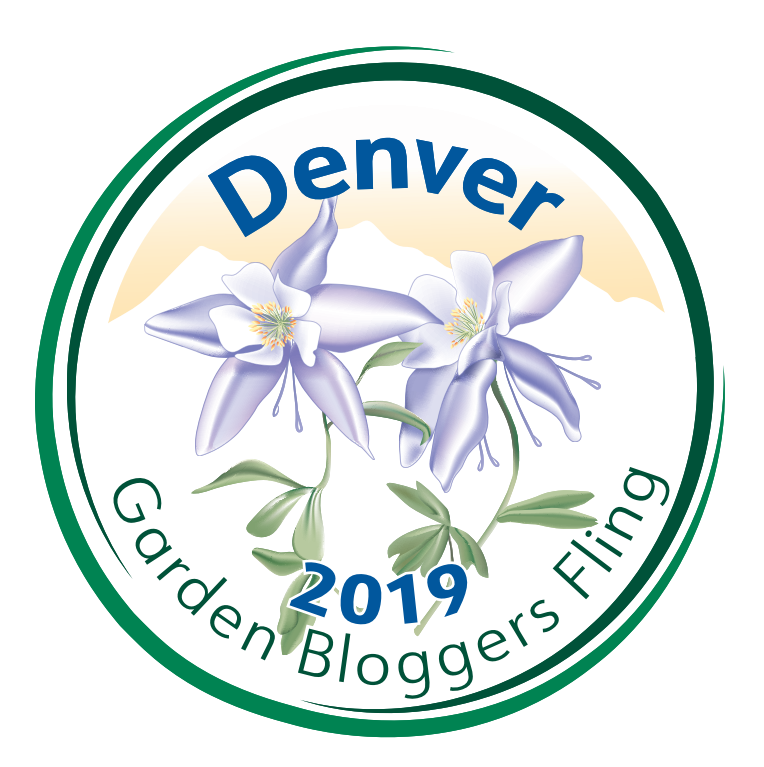 I thought slowly the shade of the oak would become a place to sit and eventually when the grass has died out as it always does under the oaks we could use decomposed granite as a ground cover….much like the red dirt of the southwest. It does beg for something….